1. Fold the left and right sides (lines labelled "1" and "2"). 2. Fold the bottom edge up to the line labelled "3". Then fold it back. This part will be the pocket. 3. Fold the top edge down to the line labelled "4" and then fold it back. Then fold the top edge down the the line labelled "5" and then fold it back. This will make the spine and top flap. 4. Spread the sides of the pocket to the sides to create "wings". Beginners can do this by folding lines "6" and "7" (first wing) and then lines "8" and "9" (second wing). Or, fold "6" and "8" and then "7" and "9". The fold lines may be off slightly depending on your printer. 5. Tuck the wings behind the front part of the pocket. The two letter "A"s should touch each other and the two letter "B"s should touch each other. Flatten the pocket. Your CD will go in the pocket. 6. Make little dog ears in the top flap (labelled "10" and "11"). 7. Tuck the top flap into the pocket. Woohoo! You're done! 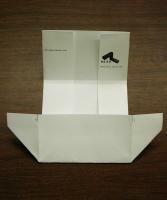 The folding instructions are based on Tom Hull's original origami CD case instructions. We mirror his original instructions in PDF and GIF formats. Check out Tom's site for cool origami pictures. Problem viewing the CD case? First make sure you have the latest version of Acrobat Reader. The latest version is 6.0. Does IE crash, complain about missing ActiveX controls, or is the case blank or missing tracks? If you are using a version of Acrobat 5 prior to 5.05, the Acrobat Reader plugin may be bad. To disable the plugin, do the following. Open Acrobat Reader. This is probably located under Start->Programs->Adobe Acrobat. Open the File menu and select Preferences and select General. Disable Web Browser Integration In the General Preferences window. Won't display? (Bad security settings) If the CD case does not display and you are using Internet Explorer 6, your browser's security settings may be too restrictive. To make them less restrictive, do the following. Open the Tools menu and select Internet Options.... The Internet Options window will appear. Go to the Security tab in the Internet Options window. Press the Custom Level button. The Security Setting window will appear. Scroll down to Run ActiveX Controls and Plugins in the Security Setting window. Set it to Enabled. Case too small? In the Acrobat Reader Print window uncheck the Shrink oversized pages to paper size checkbox. The checkbox may actually have a slight different name. Can't view Asian fonts? Make sure you have the Adobe Asian Font Pack. If you don't, Acrobat Reader will complain about corrupt or missing fonts. Other problem? If you run into a problem, please email papercdcase@papercdcase.com. Please include as much information as you can - OS type/version, browser type/version, Acroread version, and what the error message said (if there was one). Thanks! Willie Northway has written a Perl script than converts a text file to a PaperCDCase PDF file. Download it here. Doug Adams has written a script to import an iTunes playlist into papercdcase.com. Download it here. This site runs on a "collocated" (shared) computer at John Companies. The OS is FreeBSD 4. The webserver is Apache. The CD database is in MySQL and was built from the FreeDB Project's database. Most of the pages you see are generated by PHP. The PDF files are generated by a Perl CGI script that uses the PDFLib library.